On March 4, 2013, Kenyans went to the polls to elect the president, vice-president, senators, county governors, and members of parliament. Tension was high; fears and uncertainties gripped the nation, and the international community watched with keen interest. Five years earlier, on December 27, 2007, a similar event had resulted in a horrific post-election violence (PEV) that left thousands dead and hundreds of thousands displaced, and that disrupted the economic and social conditions of the country and the entire sub-region. As the 2013 elections approached, the fear became palpable that there might be a recurrence. Those fears were unrealized; Kenya had an election that the Commonwealth Observer Group, among other observers, reported to be “credible” and to have met “many of the benchmarks for democratic elections to which Kenya is committed.” Based on a series of interviews conducted in Kenya in June-December 2013, this paper evaluates the factors that contributed to preservation of electoral and post-election peace (PEP) in Kenya. Akanmu Adebayo and Muthoni Richards. "Silence! Peace in Progress": The 2013 Election and Peaceful Post-Election Dispute Management in Kenya. 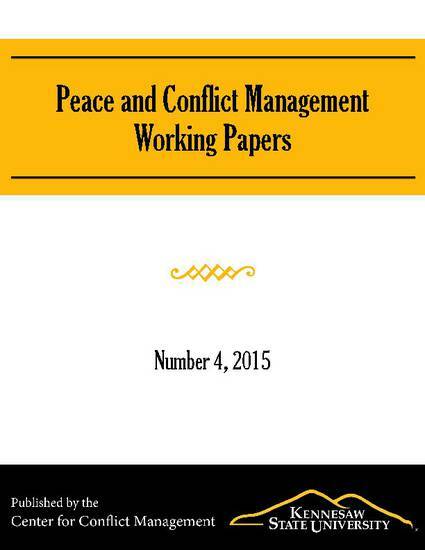 Peace and Conflict Management Work Paper No. 4, pp 1-15.